Donate at the register at any Bashas’ or Food City location across Arizona to provide care and comfort to our neighbors affected by wildfires and support the men and women battling on the front lines. We would like to extend our gratitude to the Bashas’ Family of Stores. All 104 Bashas' and Food City locations in Arizona will be supporting The Salvation Army during the month of June as Bashas’ Charity of the Month. ​Bashas’ has supported The Salvation Army for more than 30 years. 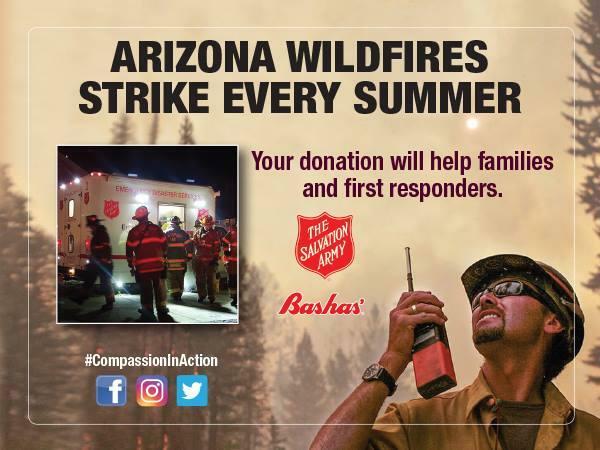 Your generous donation to any Bashas’ or Food City location in Arizona in June will help The Salvation Army provide critical relief efforts to the families and first responders impacted by fires this summer. Find a Bashas' store near you!